Why do dogs tend to pull and forge ahead? Dogs tend to pull ahead and lunge forward for a number of reasons. The primary reasons for most dogs are that they are exploratory, playful, and social, and that they are motivated to investigate new areas, new odors, new people or new dogs, as well as areas where exciting things have been found in the past. Dogs that enjoy walks may charge or lunge forward when you open the door simply in an attempt to get started. The more they pull, the faster they get where they are going. As you pull backwards in an attempt to restrain your dog, he/she is likely to resist by pulling forward even harder, since most dogs tend to pull against pressure. Although perhaps not a scientifically accurate term, this is often referred to as an opposition reflex. Therefore, the pulling successfully achieves the dog's goal. Some owners then resort to more intense forms of correction or punishment (such as with choke, pinch or prong devices). "Some dogs that are anxious or aggressive toward people or animals may in part become this way because the owner has used punitive and corrective techniques." One problem with this approach is that while some dogs may find these devices sufficiently unpleasant that their desire to pull ahead is suppressed, this is not always the case. Some dogs will learn to stop only when the correction is applied and others may continue to pull despite the pain and discomfort. In addition, a possible serious consequence is that each unpleasant correction may make the dog more anxious so that it becomes afraid of having its collar applied or becomes increasingly fearful and conflicted about going for walks. Another serious consequences is that owners who give corrections each time the dog pulls, such as when meeting new people or new dogs, may actually be causing their dog to become more fearful and anxious in the future during similar situations. In other words some dogs that are anxious or aggressive toward people or animals may in part become this way because the owner has used punitive and corrective techniques. To be successful, the techniques used to correct fear and anxiety must focus on ensuring that each new greeting is associated with favoured rewards and positive outcomes (See our handout on 'Behavior Modification - Desensitization and Counterconditioning'). Therefore, training the dog to walk on loose leash should focus on teaching your dog that rewards are achieved only when walking on a loose leash. How do I reward and train a relaxed / loose leash walk? Your dog should learn that walking with a loose leash earns rewards, and that pulling or forging forward does not. The most critical reward is the walk itself. In other words, if your dog walks with a loose leash the walk will continue (you and the dog will keep moving forward) but each time your dog pulls and the leash becomes tight, the walk will cease, (you stop moving) at least temporarily. At the same time, favoured food treats and toys can be used to entice your dog to walk by your side, while clickers and favored treats can be given when success is achieved. How can I train a loose leash or relaxed walk? It is a shame when owners are unable to engage in the simple joy of walking their dog due to extreme leash pulling. The dog should be taught through obedience training, lures, and rewards to respond to a command such as 'heel' or "steady" so that it walks calmly by your side. Training should begin in an environment where success can be ensured, such as in a training class, in your yard, in a quiet area of the park, or even inside the home. Using a control mechanism (leash and collar, leash and head halter), and highly motivating rewards, the dog should first be taught to walk by your side. Avoid other distractions so that the rewards and motivation keep the dog's interest and attention. If the dog begins to pull ahead, pulling backwards on the leash and a neck collar leads to resistance from the dog, which may stop some dogs, but generally causes most dogs to pull forward more intensely. It is better to take 1-2 steps at a time and keep your dog in the correct position, rather than trying to accomplish a long walk. If the dog pulls the leash taut, stop and wait till the dog returns to a slack leash position before rewarding and continuing the walk. As the dog learns where to be in relation to the owner, gradually walk a few more steps. Set the dog up to succeed. You can increase your dog's chances for success by using a food reward held at thigh level to keep the dog's nose in position. Why is a head halter useful? The head halter is one of the best means of gaining immediate control. Head halters include the Gentle LeaderTM, HaltiTM, or Snoot LoopTM, and are discussed in detail in our handouts on head halter training. When the dog is wearing a head halter and pulls ahead, a pull on the leash will cause your dog's head to turn toward you. At this point you can return your dog to your side and proceed. Alternately if you pull upwards and forward, the dog will pull backwards into a sit. Quickly release tension and reward. Continue along your walk and anytime the dog begins to pass you, pull forward and upward and your dog should begin to back up. It is not necessary to get a 'sit' with each pull, only a dog that stays beside or just behind you with a slack leash as you walk. If your dog is walking with a head halter and he pulls to the end of the leash, his head will turn backwards toward you. If this happens, another option is to turn and walk in the other direction (in which case the dog will again be behind you). I want to proceed to walks on the street but there are lots of distractions. What do I do next? Training should start as you exit your front door. Have your dog 'sit' and 'stay' and then open the front door. If the dog begins to run out, try a sit command, use a food lure, or wait until your dog sits (shut the door if necessary). Often a head halter is the quickest and most effective means of ensuring success since a pull up and forward should guide your dog back into a sit, and tension can be released as the dog sits. it is important to practice the sit training with a head halter in areas of minimal distractions before proceeding to the front door. Some dogs may also do better if you first practice your training at a different door. Regardless of the technique you choose to use, be sure that your dog is sitting before you walk through the door. Next, walk forward so that you are between the dog and the door, slowly lengthening the leash while the dog remains in place, but leaving no more than an inch or two of slack. Provided the dog does not forge ahead, step through the door and then allow the dog to follow (but not pass) you. 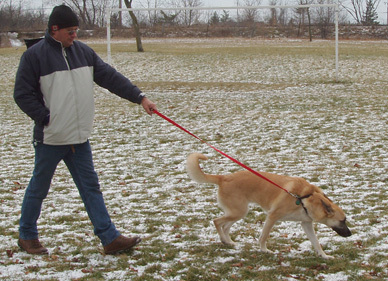 "Pulling leads to leash tension, while walking at your side earns release." Proceed into the yard with the dog following. 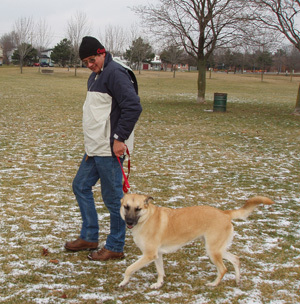 Any time the dog begins to step or forge past, the leash can be pulled up and forward so that the dog backs up, and released immediately when the dog is in place. Although the dog could be made to sit each time it pulls forward, the goal is to have the dog back up just far enough that it remains at your side. The tension on the leash is then released and the dog is encouraged to walk forward. In short, pulling leads to leash tension, while walking at your side earns release (i.e. a slack leash). If the dog "puts on the brakes" and will not follow, a tendency is to pull ahead, but, as mentioned, dogs tend to resist by pulling in the opposite direction. To get the dog up and following, loosen the slack on the lead and encourage the dog to follow verbally or with food prompts. Once you have the dog successfully heeling in the yard with no distractions, you can proceed to the front yard and the street while there are still no distractions. With practice, strong motivators and the use of the head halter, the dog can then gradually be walked in the presence of stimuli that might otherwise cause lunging and forging, such as other dogs, cyclists, or children playing. Your next step is to teach "steady", following the detailed description below. While you are standing still in a location without distractions, give the dog three to four feet of the leash. If the leash remains loose, say "steady", and occasionally give the dog a food or social reward (positive reinforcement). If the dog starts to walk away, the "steady" command is given. If the dog remains at loose leash, then reward. If the dog gets to the end of the leash and starts to tug and pull against the leash, a "steady" command is given and is immediately followed by a slight tug on the leash to get the dog's attention and stop it. Then, slack is returned to the leash. After several repetitions, the dog learns that it is rewarded for keeping the leash loose and the word "steady" means "move to a relaxed leash position". Practice a couple of times a day in the home and yard with minimal distractions. As the dog gets better, gradually add distractions. Rewards should be given for maintaining a loose leash when walking by your side. What other techniques might be successful? There are many ways to achieve a loose leash walk as long as your goal is to reinforce desirable behavior, rather than to correct what is undesirable. Walks should be relaxed and enjoyable for both you and your dog. As long as you use positive reinforcers to keep your dog by your side and you remember that any pulling leads to cessation of the walk (negative punishment), your dog should learn that the only way to get a walk is to keep the leash loose. 1. Keep small food rewards, a toy or a target in front of the dog, and intermittently reward when your dog is walking on a loose leash by your side. Clicker training is also useful. Note that rewarding loose leash walks should be included in any of the techniques you use. 2. Stop and have your dog sit each time your dog pulls and proceed when your dog is settled. 3. Another approach is to pull back lightly on the leash and head halter each time you feel tension and when the dog returns to your side, proceed walking forward again. 4. Yet another approach would be to stay slightly ahead of your dog and to pull forward so that your dog backs up, before proceeding (See 'Training Dogs – Head Halter Training Synopsis' handouts). 5. You could also let your dog walk forward in an open park and when it reaches the end of the leash, you could turn and walk in the other direction so that the dog is always behind you (see our 'Training Products for Dogs – To Choke or Not to Choke' handout). 6. Finally, it may be necessary to take a slow and steady approach to ensure that your dog learns what you want. Walk forward with a loose leash but each time your dog puts tension on the leash, turn the dog's head, go back a few steps, have your dog sit and start over again. Eventually your dog should learn that keeping a loose leash allows the walk to continue while pulling causes the walk to stop. 7. One final suggestion is to use a "no pull harness" such as an Easy Walk HarnessTM, or a head halter that pulls from behind the head such as CannyCollarTM or EasyWayTM (See our handout on 'Behavior Management Products'). The newest versions of body harnesses fit around the dog's body and forelegs with the leash attached at the chest so that when the dog forges ahead the forelegs and body can be controlled. Although these harnesses do not provide the head and mouth control of a head halter, they require little or no training and do provide immediate control of pulling. The "no pull" head halter fits over the muzzle like other head halters; however, the leash attaches behind the head so that pull on the leash puts tension around the muzzle and stops the dog's forward progress. I have tried to teach my dog to walk nicely, but certain stimuli get him so agitated I cannot control him. What should I do? Dogs that are highly aroused or aggressive towards stimuli (e.g. children, other dogs), and those that have the urge to chase or herd (e.g. joggers, cyclists) may pull ahead in an attempt to chase. Dogs that are fearful or defensive may be more aggressive when restrained by a leash since they are unable to escape, and they are more likely to defend their personal space or their family members (defensive or protective aggression). In addition, depending on the type of collar and your response, each time you pull back on the leash you may be further adding to your dog's anxiety, and therefore its defensiveness. Fearful dogs or those otherwise reluctant to leave home may be pulling and forging ahead to get back home, and if successful will try even harder at future walks. Teaching these dogs to turn away and leave the situation or to "back up" to a distance where the fear and excitement can be sufficiently reduced is often successful. How do I train "Back up"
While back up training might be achieved most quickly with a leash and head halter, since gently pulling forward usually causes most dogs to back up (see our 'Training Dogs – Head Halter Training' handout), the word back up can also be trained using reinforcement based training principles, However, before teaching your dog to walk backwards on cue, you will first need to dog to walk on a loose leash by your side. Next with your dog standing by your side on a loose leash and with some form of barrier on the other side of the dog (e.g. a wall) begin to teach your dog to back up by taking a step backward and have the dog back up one step for a treat. Repeat a few times and in subsequent sessions back up an additional step or two before giving the reward. Adding a back up command, using food as lures and using a head halter if necessary for additional guidance you should work toward getting your dog to do the back up game for 20 steps or more. How do I train "let's go" or "turn away"? Another useful command for removing your dog from a potentially problematic situation or even just to teach your dog when its time to leave an area where it might be playing or exploring is the command let's go. The goal would be to make it a positive outcome for your dog to turn and walk in the other direction. Some dogs will quickly turn and follow their owners if say let's go and turn and walk in the other direction in which case the dog can be rewarded as soon as it begins to follow. Lures and targets can be particularly useful, as soon as you can get your dog to focus. Therefore if the dog will not immediately turn, a leash and head halter or a pull control body harness (which attaches to the front of the chest) will achieve a turn just by pulling and beginning to walk in the other direction. Remember to release tension and reward as soon as the dog begins to follow. 1. The goal of this exercise is to teach the dog to turn 180 degrees and go in the opposite direction. 2. Have the dog at your side wearing a leash and collar or head halter or leash and no pull harness (with the attachment at the front of the chest) and have food treats available. 3. Begin to walk forward 10-12 steps. 4. Take a food reward, place it in front of the dog's nose and say, "lets go" and quickly turn and back away using the food reward to get the dog to follow you around. Of course the head halter can help to more quickly turn the head in your direction but release and reward as soon as your dog begins to move toward you. 5. Once the dog follows, you turn and begin to walk forward in the opposite direction bringing the dog with you. 6. After a few steps do it again. Further suggestions to control overly anxious and aggressive behaviors can be found in our handouts on 'Behavior Modification - Desensitization and Counterconditioning', 'Aggression in Dogs – To Unfamiliar Dogs', 'Aggression in Dogs – Territorial' and 'Fears and Phobias in Dogs – Animals and People'. If the lunging and pulling behavior is accompanied by barking, growling, snarling, snapping or biting the situation is serious and needs professional intervention by a veterinary behaviorist.